Algorithm or Formula on the basis of which biding bots upvote posts. Helpful guide on how to use biding bots. Sharing some useful information that many biders don't know. So on my second last post which was about steembottracker(a useful website related to upvote biding bots, created by Yabapmatt and co-owner Aggroed), I discussed and explained the different elements related to biding bots. I gave few examples how this thing really works but very basic info was explained by me. That post was already too much lengthy so I could not explain the algorithm or formula there. So I had to leave that for my next post. If you want to check that post, click here. Today, I will be explaining the formula on the basis of which biding bots work or upvote posts. I often use steembottracker to see how people are biding on different bots. When I open steembottracker, I go to the details tab of different bots and I notice that so many people use biding bots but they don't know how that really works. And instead of having profit, they lose a portion of their invested SBD's and Steem while biding. I am making this post to help those people to understand, when to bid and how much to bid to not lose a portion of their invested SBD's and Steems on the payout day of their posts. I am not here to encourage people to use biding bots for their profit but I really want to help those who are losing a portion of their SBD's and Steems while using biding bots. Its a helping guide for those who post quality content and have not been noticed yet but for the cause of attention they use biding bots to get people's attention. The use of biding bots is acceptable or not in the steemit community, its a big debate. I am not gonna jump into that. The purpose of this post is to help quality content users to at least get the SBD and Steem back what they have spent on biding bots or to minimize their loss. Suppose 'ABC' makes a post and placed a 3 SBD bid on an upvote biding bot to promote his post and gets a return upvote of 7$(not US-$ but the one shown on steemit.com). So in this case, if ABC gets the upvote on his post after 30 minutes then 25% of the payout goes to the curator's share. Lets do a little math. (from now on the $ sign used represents the one shown on steemit.com). Curator's share will be 25% if upvote is received after 30 minutes. 25% of 7$ = 7 x 0.25 = 1.75$ (this is the curator's share that will be deducted from payout). So divide 5.25 by 2 = 2.625 is the amount of SBD, ABC will get on payout day. 2.625 – 3 = -0.375 (negative sign indicates loss). So this means, ABC lost 0.375 SBD on his bid. "But he gained Steempower as well”. at the end he will be left with 0 SBD's in his account wallet. Now if ABC's post gets an upvote of 7$ on a bid of 3 SBD's in under 15 minutes mark then he may get profit from this bid or the damage could be a little less. Because the curator's share will be 15% in this case. The people who post quality content as well as use biding bots and have some whale or dolphin following then I think if they still pay attention to this method, it will benefit them too but if they don't, it will not matter much to them. Lets suppose XYZ is a user who have earned some dolphin and whale following or a huge number of followers. He made a post, he placed a bid of 3 SBD and in return he get a 7$ upvote from the bot. He have dolphin and whale following. So lets suppose he gets a 3$ upvote from them as well. And it raised his post payout to 10$. Now lets calculate XYZ's profit and loss. Suppose all the votes casted are after 30 minutes. Half paid in SBD's and half in Steempower. 7.5 divided by 2 = 3.75 SBD on payout day. Calculating XYZ's SBD profit or loss. 3.75 – 3 = +0.75 SBD (positve sign indicates profit). This means XYZ made a profit of 0.75 SBD on his bid. Plus the steempower he gets. Overall, his bid was a profitable bid. I have researched about the biding bots a lot and this is what I came up with. As we all know biding bots are programmed through computer programming, so it is possible to find the algorithm they use for upvoting. It took me almost 4 hours and a number of fail bidings (loss in SBD) to figure it out. Now I am gonna share this information with you guys with few examples. When you open steembottracker, make sure to select the Post rewards(what is shown on steemit.com) option from the display currency tab. I have explained about it in detail in my second last post. I am using @postpromoter bot as an example. By clicking on the details tab (blue button) a window will open like the one shown in the picture below. Now in the above picture as you can see, I am using the data of last round because the votes are confirmed. You can see total vote value of postpromoter which is 689.40$(not US-$ but the one shown on steemit.com). This is the vote value of postpromoter bot at 100%. Below that is the amount of total bids in SBD and Steem. And we have the ROI value. The ROI value have big impact on larger bids but not so much on bids that are close to minimum value of the respected bot. The $ sign that will be used in calculations will be the one shown on Steemit.com not the US-$. As you can see in the picture above, the user Rijalaronaceh have placed a bid of 3 Steem and another user by the name of Nazmul8877 have placed a bid of 3 SBD. Rijalaronaceh will get a vote % of 0.65% and Nazmul8877 will get a vote % of 0.81%. The vote value as shown for Rijalaronaceh is 4.50$ and vote value for Nazmul8877 is shown to be 5.56$. But they will get more than that. Rijalaronaceh will get a 1% vote value instead of 0.65% and it will be approx. 6.89$. Nazmul8877 will also get 1% vote value instead of 0.81% and it will be approx. 6.89$ as well. The reason for it is, if the bidder is getting a vote% equal to or greater than 0.55% then he will get a 1% vote value instead. If its less than 0.55% then he will get 0.5% vote value. 100% vote value of postpromoter bot is 689.40$ as shown in above picture and its 1% will be 689.40 divided by 100 = 6.89$. (Calculations are done on behalf of the data shown in the picture. Data in the above picture is collected at the time when the screenshot was taken). Here are few screenshots taken from another useful website called steemworld.org built by @steemchiller to proof all the calculations done above are correct. Values infront of weight shows the vote value i.e, 7$ (only vote value of postpromoter bot). 9.50$ is the overall value of post, combining all the votes. Don't get confused by it. The little difference between the values(I said 6.89$ and 7$ shown in the picture) is due to fluctuating values of Steem at the moment. Values infront of weight shows the vote value i.e, 6.98$ (only vote value of postpromoter bot). 7.55$ is the overall value of post, combining all the votes. The little difference between the values(I said 6.89$ and 6.98$ shown in the picture) is due to fluctuating values of Steem at the moment. Another screenshot of the same biding round on postpromoter bot. To clear the other half of the formula. In the above picture, the user Wolfje have placed a bid of 4.96 SBD and is getting a 1.32% vote and its value is shown 9.10$. But he will get approx. 10.33$ which is 1.5% vote value of postpromoter bot. 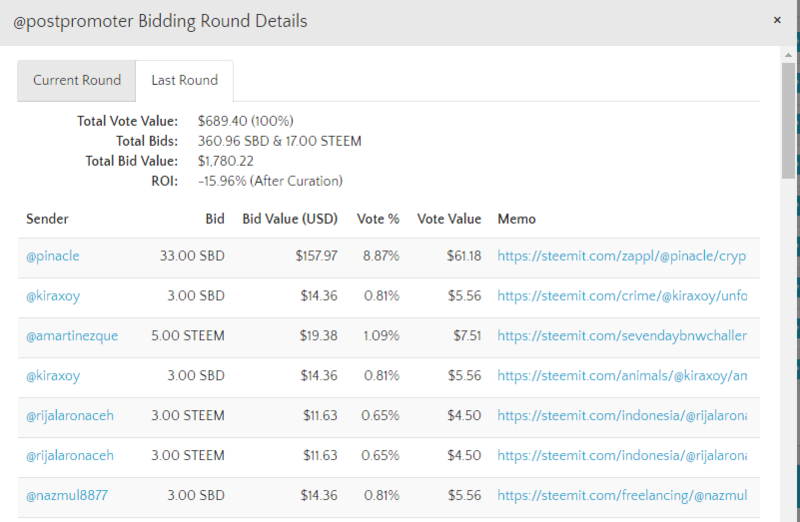 The other user by the name of Steem.power have placed a 4 SBD bid and is getting a 1.07% vote and its value is shown 7.34$. But he will also get the same as Wolfje i.e, 10.33$ vote value. The reason for this is that if the vote % is equal to or greater than 1.05% then the vote will be cast at 1.5% vote value. If the vote% is less than 1.05% then the vote will be cast at 1%. The same formula applies for the rest of the percentage values as well. Some general and random examples, 2.20% and 2.45% will be upvoted as 2.5%, 3.02% and 2.80% will be upvoted as 3%, 4.65% and 4.95% as 5%, 10.40% and 10.05% as 10.5% etc. This is how the biding bots work. I hope it was helpful for everyone. If you have any questions, feel free to ask them in the comment section. Disclaimer: Please do your own research before taking any steps or doing anything. The above information shared, is on behalf of my own research. In case of any kind of loss, I will not be responsible. Don't forget to upvote, comment and resteem. It helps a lot. I felt bad whenever I see people losing their SBD's and Steems while using biding bots due to less knowledge about how biding bots work. So, I thought to make a post about it. I am happy that it was helpful for you. I think I achieved my goal to help people. And will try to continue this throughout my Steemit journey. This is a great post; however, it zooms over the head of the ordinary 'bot' user; and, clearly explains why most are losing money/SP overall, making the rich, even richer. Just a friendly suggestion: For future reference, please note that the correct spelling of bidding is with two d's, not one. By the time you read this, the payout will prolly already be in effect. Btw, did you use the bot for this post?...Just curious. Lastly, for learning purposes only, how is it that your rank is at 53?...Again, just curious. Thank you for the spelling correction. At first, I tried not to use bidding bot on this post so I left it for around 48 hours, I thought it will get noticed by the community because its related to a very important topic. But after 48 hours, I came to realize that once again my post is left unnoticed(very few response) in the deep steemit ocean. I spent almost 8 hours on this post, so I was left with no option other than to use bid bots. That No "53" is called reputation not rank. It increases when you get upvotes(whether you get upvotes from biding bots or other users) on your posts and comments. Thank your for your reply regarding the bot payout. Now, please allow me to further the conversation. Did the bot cost you more than the payout? Again, just curious for the sake of helping everyone, especially newbs to Steemit, decide if the bots are worth the money. Yes, but, what stands out is comparison of your Wallet and mine. Yours is bot-supported, mine is not. I genuinely want to ask if you think your investing in bots is paying off for you in the long run? I know it's paying off for them, but, I'm not hating; as it's their effort to be more than a penny-player with the Steem community. Ethics out of the equation, that's capitalism...free market. Lastly, I presume it's safe to say, in 2 hours, I will see the ~70. added to your Wallet. In earlier times, the bots were so much profitable(to speak the truth) like a month and half ago in every term possible. But now if you consider raw SBD's(to get in return) only, the margin is very less now. Overall, if you bring SP in consideration too then its still profitable. Yes, but, what stands out is comparison of your Wallet and mine. Yours is bot-supported, mine is not. If you think your posts deserve to get noticed then its no wrong to promote your posts using bidding bots to make it reach to more people. I am smelling some sarcasm going on but its ok I am taking no offense. If I can help someone who is seeking help then its OK for me to bear them too(either done on purpose or not). Will you ever leave an opportunity which is going to benefit you? A simple question. This is the case as using the bots. The payout(73) in terms of raw SBD is a loss for me but with addition of SP, its still profitable. Hope, I answered your questions the best way I could. Hi @arslanhyder! You have received 0.1 SBD tip from @spiritualmatters! You got a 3.13% upvote from @postpromoter courtesy of @arslanhyder!